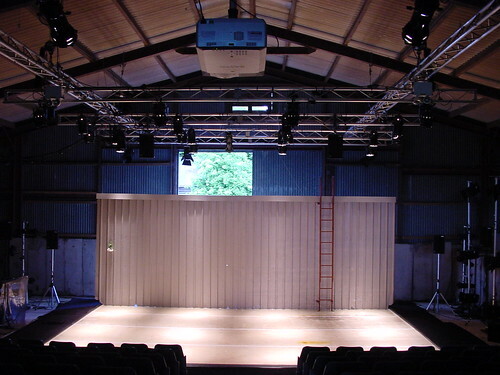 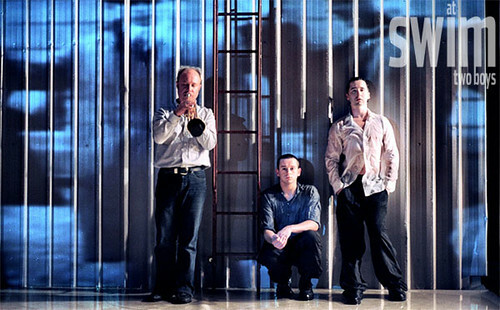 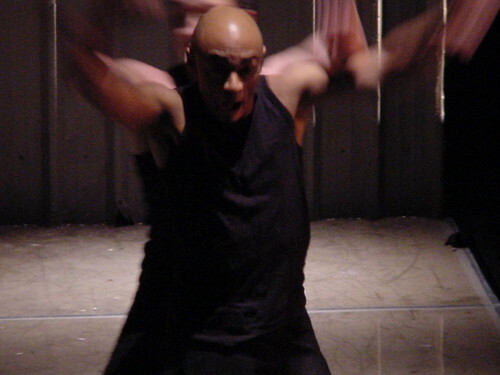 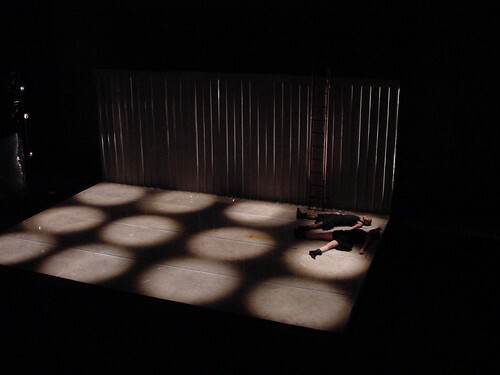 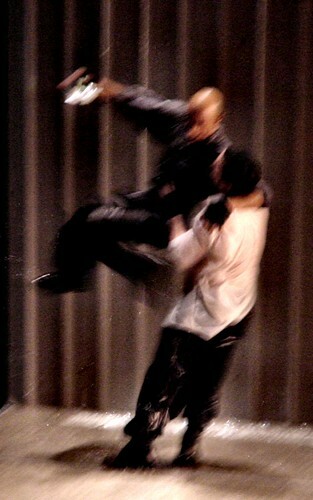 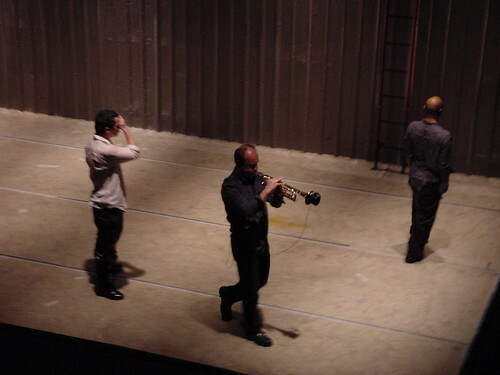 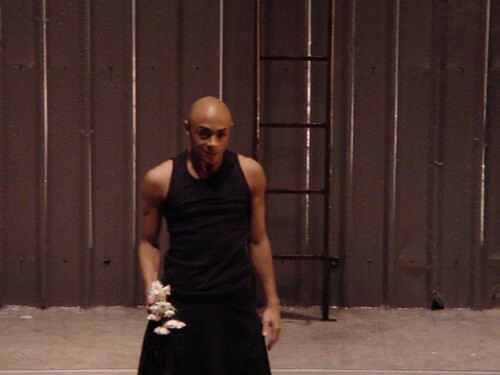 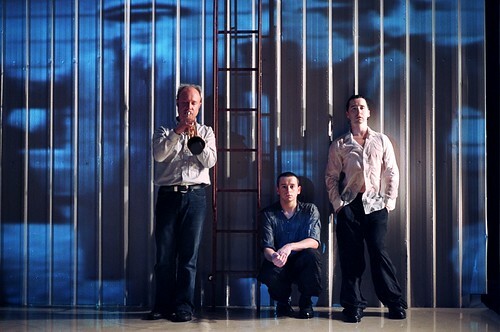 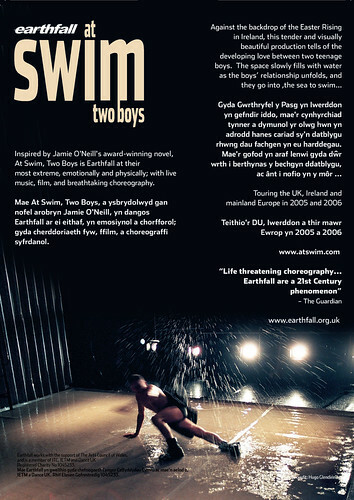 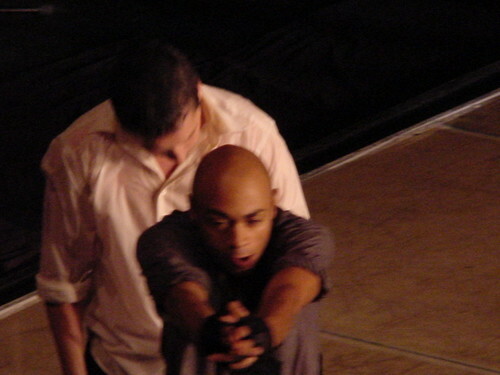 At Swim Two Boys: Winner of the 2005 Theatre in Wales Award for Best Dance/Physical Theatre Production. 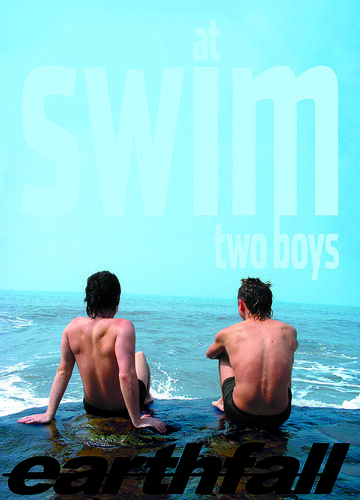 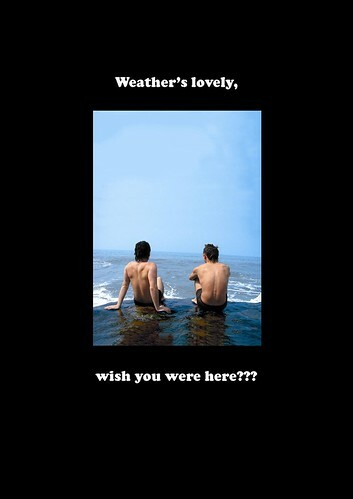 In collaboration again with author Jamie O’Neill, and inspired by his award winning novel, At Swim, Two Boys told of the developing love between two teenage boys in an historic time of political upheaval. 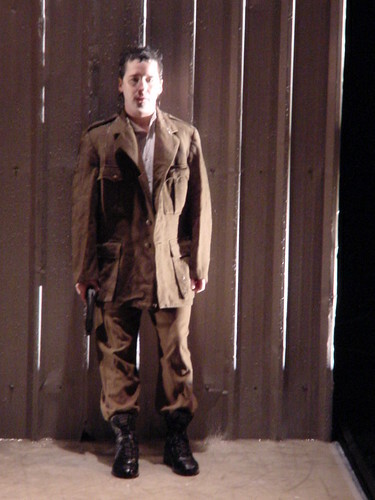 The performance, like the novel, was set against the backdrop of the Easter Rising in 1916, the time of Ireland’s fractured uprising against British rule and the war in mainland Europe. 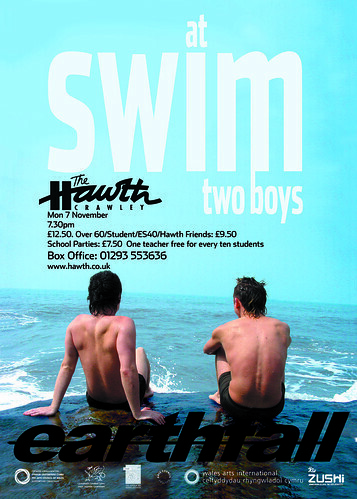 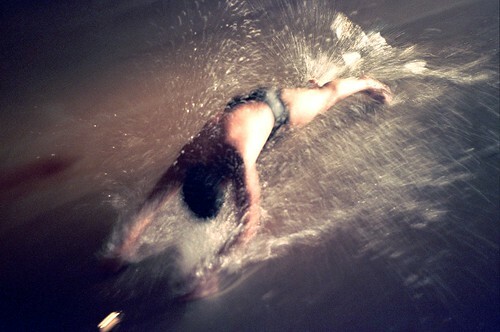 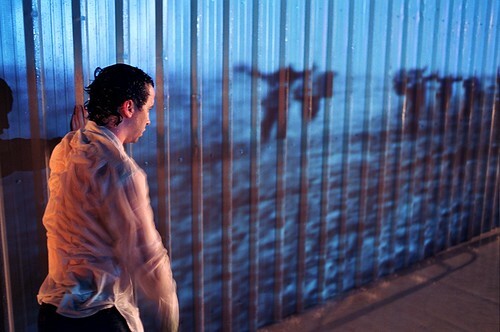 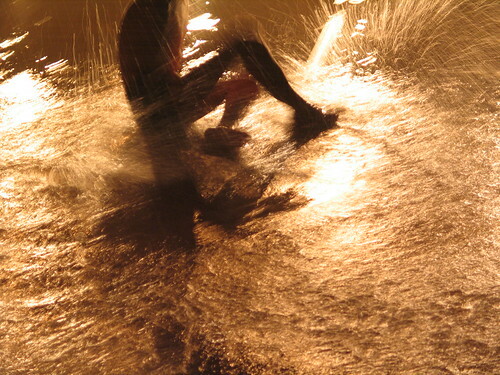 Jim Ennis and Jessica Cohen, with performers Cai Thomas, Terry Michael and designer Gerald Tyler, decided to set the performance within water, as the most vital developments of the boys’ relationship take place when they go to the sea to swim. 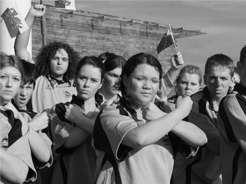 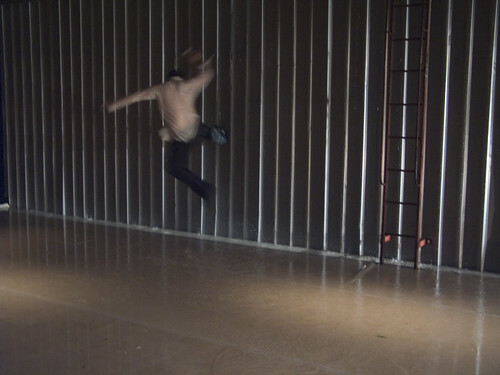 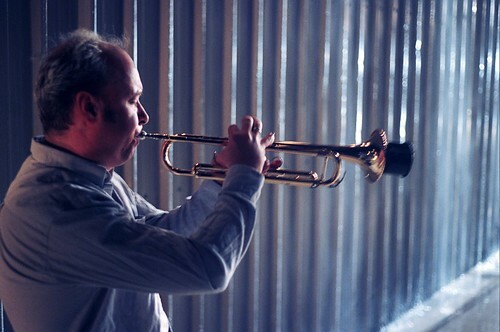 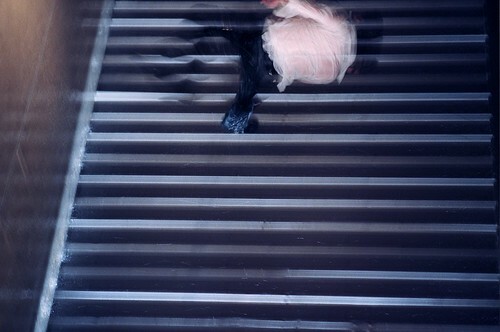 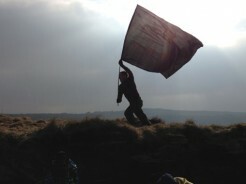 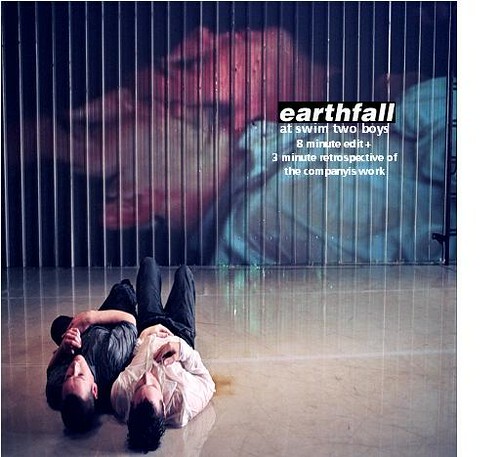 In previous issue-based performance works, Earthfall have placed their themes in the middle of extreme conflict and within that conflict they have explored where the last vestiges of humanity may lie. 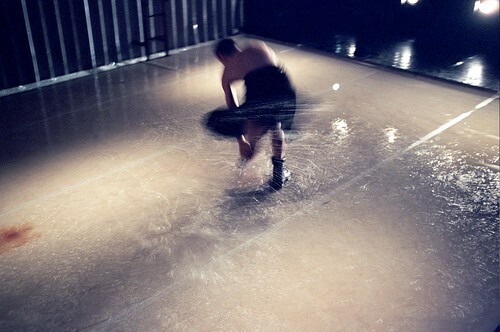 The work may reflect the poor behaviour of governments and regimes, but it manifests itself in performance, through the conflicts and harmonies of individuals and ideas. 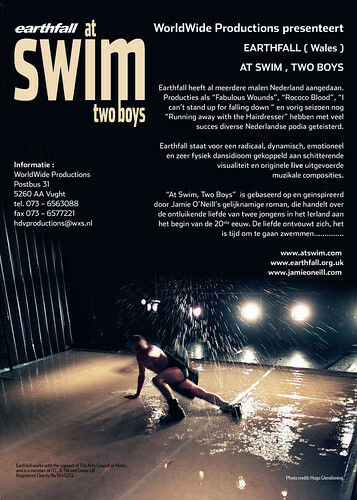 With Jamie O’Neill, Earthfall distilled this epic story to its core, portraying the relationship between the two boys, using emotive physicality and imagery with few words, within a provocative performance environment. 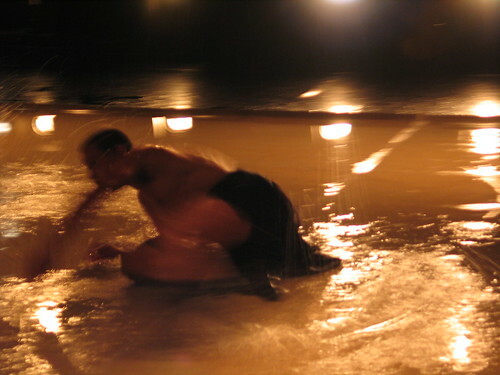 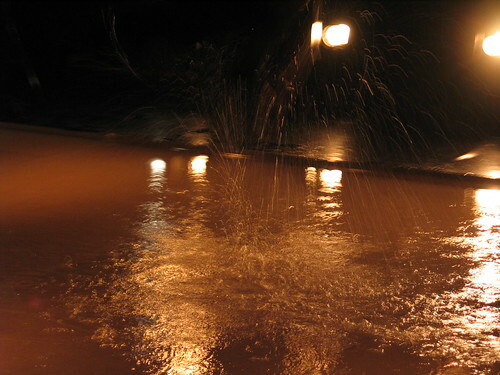 In the performance environment Earthfall created a 3.5 metre high and 8 metre wide sea wall where water cascaded down into the performance area to a depth of 15 millimetres. 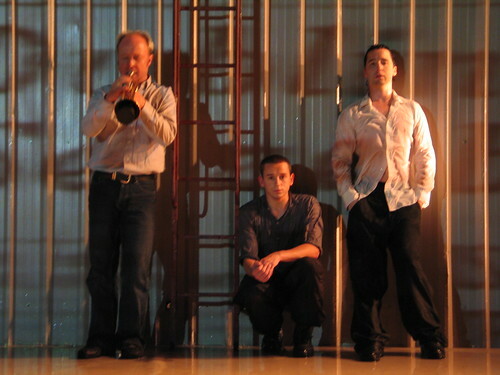 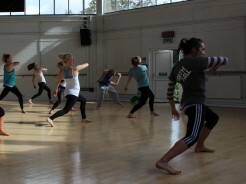 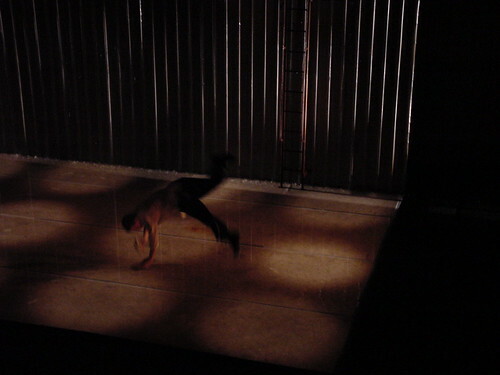 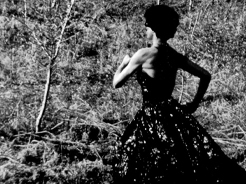 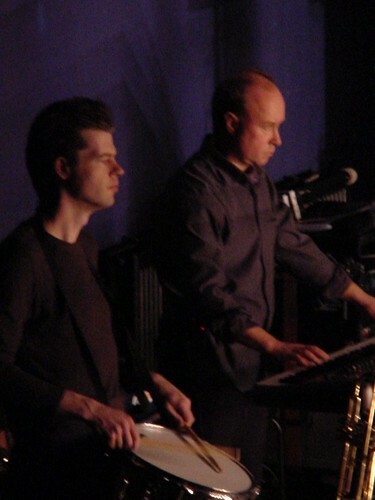 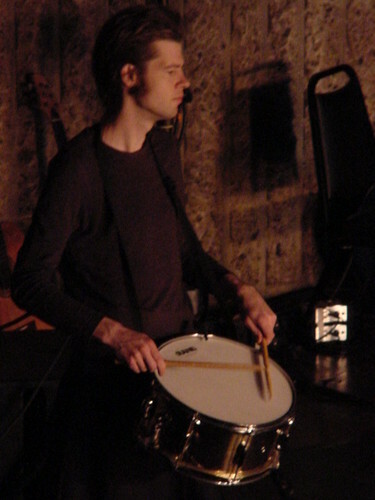 All choreography and imagery, combined with Frank Naughton and Roger Mills’ live music, were developed to incorporate this. 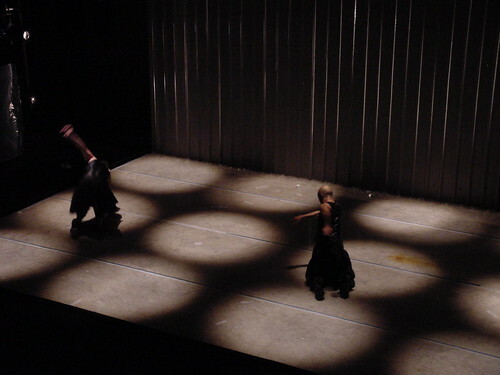 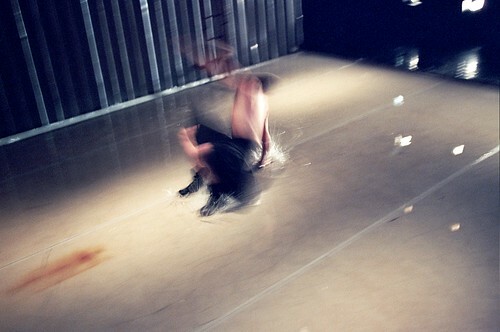 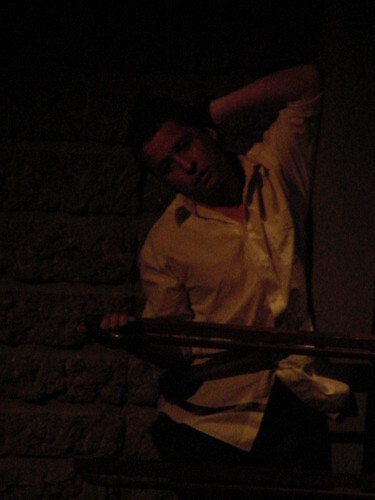 The choreography and music went from extremes of crashing physicality of body and sound to sensuality and tenderness. 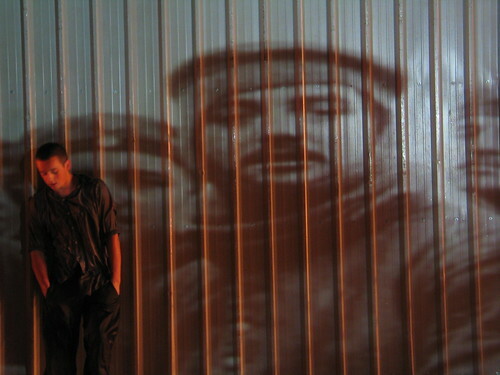 Projected on the sea wall at intervals were authentic images of the Easter Rising and WW1 as well as live camera-work. 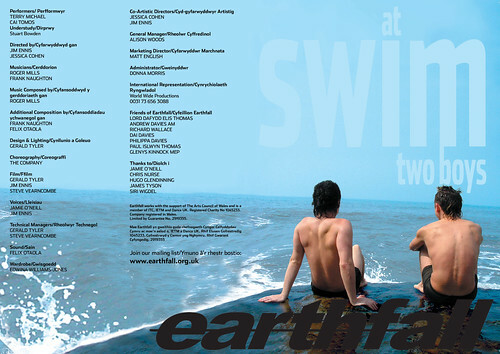 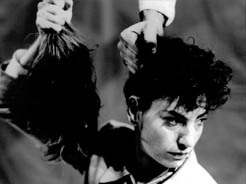 The environment and the ensuing relationship was highly evocative for audiences and within the discrete narrative Earthfall depicted a gradual awakening politicisation of the boys, both sexual and societal, which ended with one boy being shot while trying to protect the other from a bullet. 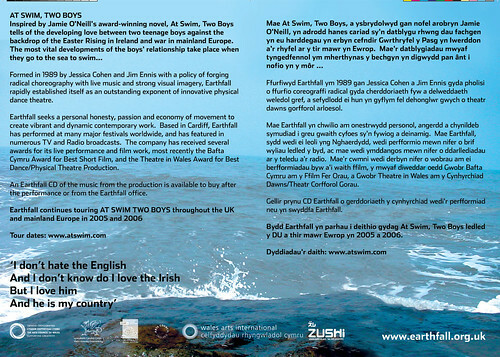 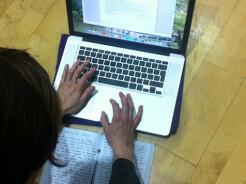 At Swim Two Boys toured for 3 years at major theatre festivals throughout the UK, West and Central Europe.